Te Ahu in Kaitaia is the civic and community centre for the northern region of the Far North District of New Zealand. It was designed and built by local architectural practices and contractors and is a venue for concerts, plays and other cultural events as well as conferences, seminars and meetings. 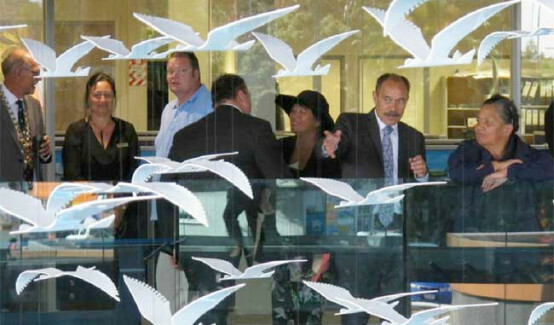 It was formally opened by Governor-General, Sir Jerry Mateparae, on Saturday 28 April 2012. The Te Ahu Charitable Trust is tasked with the funding, construction and administration of a multi functional community facility for the northern region of the Far North district. Deliver a sustainable community facility that will achieve the vision. Produce a landmark building that extends a ‘welcome’ and reflects our ‘sense of place and belonging’. Place emphasis on reflecting our culture and the seven peoples of the Far North. Provide facilities that will deliver appropriate and coordinated accommodation for stakeholders. Minimise / prevent duplication of services and facilities. Ensure the project avoids unnecessary expenditure and achieves best value. The Far North Regional Museum and the library had for some years identified the need to expand their buildings. This need resulted in a plan for Council, through its Long Term Community Plan, to look at rationalising all Council buildings in Kaitaia to match community expectations. The demonstrated need for a multifunctional facility to provide modern, purpose-built spaces for Kaitaia’s library, museum, i-SITE and service centre – especially the arts and culture – arose out of the LTCCP, with the recent addition to integrate the Far North Community Centre and Little Theatre. It is acknowledged that to succeed in the venture to construct a multifunctional community facility, it is vital that the project be driven by the community. The Te Ahu Charitable Trust Inc., a Council Controlled Organisation (CCO), was officially formed after nominations were called from the Far North community. Providing, maintaining, resourcing, and managing multi-purpose community facility buildings to be located in kaitaia and intended to house a local museum, public library, visitor information centre and/or gallery and art display areas, for the benefit, use and enjoyment of the kaitaia and surrounding communities. The Trustees meet on a regular basis in the Te Ahu Video Conference room from 9.00am to 1.00pm.